WIND ENERGY PRODUCTION TAX CREDITS A WIN FOR PORTS: Many US ports handle wind energy components. PABs provide a significant source of financing for port infrastructure projects. Tax bill removes tax-exempt status of advance refunding, which will increase the cost of infrastructure investments. The final tax legislation continues the existing level of wind energy production tax credits. The American Association of Port Authorities (AAPA) is pleased that several important tax related policy priorities were addressed in the final Tax Cuts and Jobs Act legislation passed yesterday by Congress. These included provisions related to tax-exempt private activity bond (PAB) financing and wind energy production tax credits. 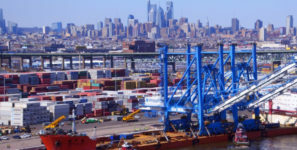 “Public port authorities throughout the country are investing billions of dollars in needed infrastructure improvements,” said Kurt Nagle, AAPA’s president and CEO. “With PABs providing a significant source of financing for these projects, AAPA worked with several transportation and bond-related coalitions to strongly advocate against the elimination of tax exempt status for PABs. We’re extremely pleased that the final legislation keeps the tax-exempt status for PABs. “This provision will help foster investments, not just in and around ports, but also in needed infrastructure development throughout the nation,” Nagle added. Another win for ports and for all engaged in wind energy in the final legislation was the continuation of the existing level of wind energy production tax credits. The original House bill would have reduced the tax credit level. A sizable number of ports on the east, gulf, and west coasts and the Great Lakes handle wind energy components as part of their cargo mix. AAPA also supported the House bill’s repeal of the alternative minimum tax (AMT). Most PABs issued by ports are subject to the AMT, and therefore, increases the cost of financing. In the final bill, Congress repealed the AMT for corporations, but retained it in a modified form for higher-income individuals. The association, along with other groups, had also urged continuation of the tax-exemption on advance refunding of municipal bonds. However, the final legislation takes away the tax-exempt status of advance refunding, which is likely to increase the cost of public infrastructure investments.